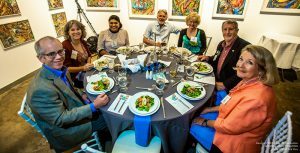 GWF Board Member Tom Jones and his wife, Celeste (far right) enjoy a family style dinner at the Clean 13 celebration. On March 14, approximately 200 guests gathered for the Georgia Water Coalition’s Clean 13 Celebration to recognize extraordinary efforts on the part of businesses, industries, local governments, non-profit organizations, and individuals to protect Georgia’s water and natural resources. Some of the outstanding projects included modifying an old dam to open up the Middle Oconee River, recycling water to reduce demands on the Flint River, and implementing high-tech irrigation systems for farmers. CONGRATULATIONS TO THE 2018 CLEAN 13 HONOREES. READ THEIR STORY: Apalachicola Chattahoochee Flint Stakeholders: Group provides road map to end tri-state water dispute. 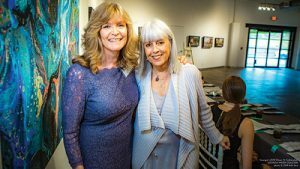 GWF’s Gina Rogers and consultant Sandy Layton worked tirelessly to orchestrate a perfect evening for the Georgia Water Coalition. READ THEIR STORY: City of Augusta, Columbia County, City of Savannah: Water utilities invest in study to restore Savannah River. READ THEIR STORY: Clayton County Water Authority: Water utility restores flows to Flint River. READ THEIR STORY: Cobb County-Marietta Water Authority: Water conservation leadership reduces demands on Etowah River and Lake Allatoona. READ THEIR STORY: Glynn Environmental Coalition: Coastal watchdog works to protect Brunswick-area communities from toxic pollution. READ THEIR STORY: Interface: Industry leader in sustainability continues work to conserve natural resources at its LaGrange, Atlanta and West Point facilities. READ HER STORY: Dr. Jenna Jambeck: UGA Environmental Engineer searches for solutions to plastic pollution. READ HIS STORY: Representative Jon Burns: House Majority Leader from Effingham County champions conservation funding. READ THEIR STORY: Lodge on Little St. Simons Island: Eco-tourism destination protects 11,000-acre barrier island. READ THEIR STORY: Riverview Farms: Organic farm protects Coosawattee River. READ THEIR STORY: Southwire: Carrollton manufacturer leads on sustainability practices, community improvement. READ THEIR STORY: Stripling Irrigation Research Park: Camilla-based UGA Agricultural Research Park promotes water conservation. READ THEIR STORY: University of Georgia Warnell School of Forestry & Natural Resources: Dam removal revives Middle Oconee River near Athens.